Why We Keep Coming Back … Many guests who come to Tim Pond return year after year. We are among that group. As a group, we come back for a number of reasons. The main reason for most of us is the fishing. Tim Pond brook trout are plentiful, colorful and feisty – they are just plain fun to catch. The Rangeley-style boats offer a touch of nostalgia and provide a stable fly casting platform. The dock assistant (a.k.a. “boat boy”) makes docking/undocking and getting in and out of boats a lot easier. We find this more important as we get older. Besides the fishing, Tim Pond offers a peaceful wilderness setting of great natural beauty. Wildlife viewing is a daily pastime. We know the loons will be around and hope that moose, deer, a Bald Eagle and maybe a fox family will be around too. The three homemade meals served up daily in the dining room are reason enough to come back. And the cookie jar is always there for when we feel a bit peckish. The rustic log cabins are clean, cozy and comfortable. Having to fire up the wood stove or fireplace takes us a step back in time. Old friends from past visits may also be back in camp. For many of us, the staff has become family and getting reacquainted each year with Harvey, Betty, Bill, Darcie, Candy, the wait staff and “boat boy” makes returning to TP seem like Old Home Day. For the two of us, Tim Pond Camps is not just about any one or two of these things – it is about all of them taken together. That is what makes up the “Tim Pond Experience”. That is why we keep coming back. Thank you again for enabling us to have one of the best vacations we’ve ever had, this past summer. Tim Pond Camps is the perfect place for someone seeking peace, tranquility, Nature at its best, while Moose at Tim Pond Camps in Eustis Maine being pampered with hearty meals, attentive staff that always makes you feel like “part of the family,” while living in cabins that perfectly capture the right combination of rusticity and homey comfort really added frosting to the cake. Tim Pond Camps is just on the Earth side of paradise. We look forward to the day we can return! We always stop for a family and friends photograph by the old green truck on the dirt road to the camp. Year after year, the truck is slowly being taken over by the landscape, while my kids have grown to adulthood. During our annual visit, we meet new friends, who are often the young children of our three generations deep community “finally” old enough to join us. We remember those no longer with us and retell their favorite jokes and stories. Fathers, sons and grandchildren still find time every year to put aside everything else and make a trip to fish, eat, tell stories, compete for biggest fish, admire the float plane and see Darcie, Bill, Harvey, Betty, and of course Candy. I really don’t remember a Christmas present I gave or received, but I still remember that beautiful copper colored brook trout I caught by the dam, and the smile on Jessie’s face when she caught her first fish. I take a couple of casts by the dam every year hoping to see that fish again. Sometimes I do. For me it’s time away from everything, with family and friends, with annual rituals to be shared and enjoyed in a place of achingly beautiful peace and harmony. “See you next year!” we say amid the dandelions of June, and take one more group picture with the winner of the Rufus Cup. We “discovered” Tim Pond through our good friend, who is also Bill’s fishing buddy. Gerard had helped us finish the interior of our house so we could be married in it on 11/29/85. He wouldn’t take money for his time, so Bill asked him to pick a place to go fishing, expenses paid. After some research, he selected Tim Pond. Gerard and Bill made that first trip during September 1986. It was typical Tim Pond weather, 60 one day and 20 the next. Windy one day and very windy the next. They caught less than 10 fish between them but still had a great time between the relaxation, food, and cribbage games. The following year, we spent our first full week together at Tim Pond and we have been going every year since, sometimes twice a year. We have covered all the seasons, from late May to late September. All of our children, grandchildren, and some of our friends have been at Tim Pond with us over the years and our oldest daughter and family are fast becoming regulars. During our working years (1987-2000) it was difficult to determine whether we were going to Tim Pond to escape or to fish. The escape was probably more important – no TV, no radio, no newspapers, and strict orders left at work that we were unavailable unless the world was about to end. We needed the time to unwind and our visits stretched to 10 days for the initial visit and 4-7 days later if we needed more! Whether walking or driving the logging roads and not seeing another human or sitting on the porch reading or snoozing, we did relax! The most impressive thing about Tim Pond as Bill enters his 20th consecutive year and Carol enters her 19th is the consistency of the total operation. We started with Betty and Harvey and have spent the last years with Bill, Darcie, and Candy and nothing has substantially changed. The small changes have been for the better, both in the operation of the camp and the fishery. Bill actually caught his largest Tim Pond trout ever in 2005. For the rate, which includes lodging (they make the beds), great meals, boat, motor, gas, etc., it’s still a bargain. The personal service is important to us. We feel that the staff appreciates our consistency as much as we appreciate theirs! 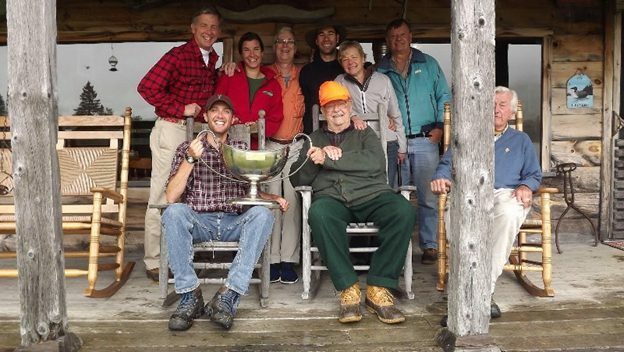 We hope our relationship will continue for many more years and that the Calden family will continue to be stewards of the Maine wilderness. I first came to Tim Pond Camps in 1995. My deer hunting partners and I had been hunting in the western region of Maine for the previous nine years and enjoyed the area very much. The camp we were staying at was sold, we were not satisfied with the new owner’s philosophy on camp management and we all decided that it was time for a change. My partners put me in charge of finding a new camp that would meet our standards. We contacted a number of the camps in the area via mail asking for information on the camp and the hunting in the general area. Betty called back on New Year’s Day of 1995. From the first time I spoke with her I knew that she and Harvey ran a first class operation at Tim Pond and that the camp met our standards. The decision was made to call Tim Pond Camps home during the third week in November and we have never been disappointed in that decision. I arrived at camp for the first time on a Sunday morning, called the camp from the Pines Market and was given a list of items to pick up for Betty and the camp. When I arrived in camp there was the normal hustle as once crew of hunters were leaving at a leisurely pace and Betty and her staff were busy making the cabins ready for the next group of hunters. The cabin that I was staying in was spotless. That year my partners were not able to join me for various reasons. I was the “new” guy at camp in an area that was not familiar to me. Harvey made sure that I was able to navigate the area; the “regulars” in camp accepted me and made sure that I have a good idea of the lay of the land. The area was being actively logged then and it was a challenge to avoid the logging trucks. I saw a lot of moose (30) and deer (6) that year and had a delightful stay. My partners (Cliff Libby and John Rust) and I have been back every year since then, sometimes not all of us, and sometimes not for the full week as business pressures always seem to increase and not decrease during the third week of November. Every trip has been enjoyable. Service is always at a top priority with the staff, food is excellent and plentiful and the accommodations in excellent order. The original character of the peeled cedar log cabins is preserved from year to year and this adds an additional level of charm to the whole experience. The transition in management from Harvey and Betty to Bill and Darcie has been seamless. The quality of the food under Candy’s vigilant eye and culinary skill is constant year to year and excellent. I hope to find time to visit the camp in the fall and get some hiking in. The area offers some excellent trails near the camp and the Appalachian Trail can be accessed in Stratton if you are so inclined.